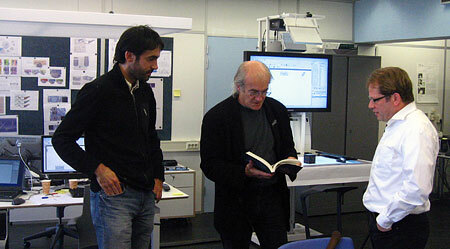 Bill Buxton, the Principal Researcher at Microsoft Research, has visited us to inquire about one of the tools that we are developing currently for sketching interactions called Sketchify. Sketchify is a toolset for sketching of novel classes of user interfaces, which we use in education of interaction designers. Dutch Design Week is ON! The Eindhoven University of Technology (TU/e) is known for its commitment to innovation. Researchers and students are experimenting with new concepts and technologies in order to design the society of tomorrow. In the area of the TU/e, you will therefore come across al kinds of innovative projects. You can, for instance, take a look behind the scenes of the Faculties of Industrial Design and Architecture, Building and Planning. Besides work by graduates, exhibitions, photo exhibitions, and award ceremonies, there are lectures, performances, discussions, and workshops at the TU/e campus all week long. The Gaslab provides a well-equipped Fablab, where you can hack and print designs on 3D prototyping machines yourself. In the evening, you can listen to the inspiring stories told by designers, artists, and scientists, and in the Science Café, you can join discussions about the design of living organisms. Find out how smart design can be! The TU/e is within walking distance of the Eindhoven Central Station.